When Gilad Schalit had been held captive by Arab terrorists, his father's campaign theme was that Gilad was "everybody's son" and we should do everything possible to free him, even release all those convicted terrorists. 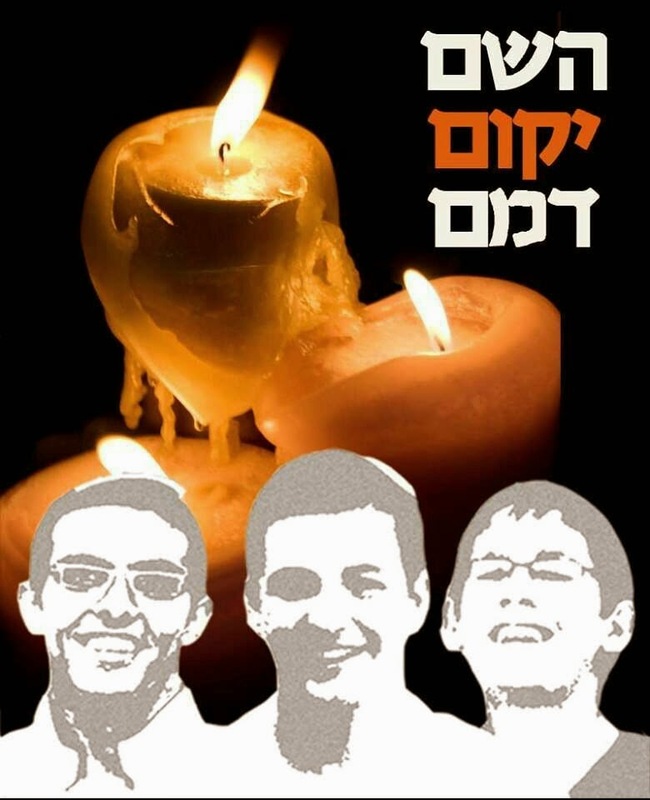 I think that for many Israelis and Jews all over the world, the three Jewish teens who had been kidnapped by Arab terrorists two and a half weeks ago were also "our sons," and when a close family dies, the custom is to do kri'ah, rip part of the outer clothes. The mourner doesn't change to clean clothes daily, nor bathe except in honor of Shabbat. The three kidnapped teens, Eyal, Gil-Ad and Naftali became our sons, our responsibilities. Hearing that they had been murdered pretty much immediately after the kidnapping makes it very clear that this Arab terrorist act was for the violence and not for any political or diplomatic end. The murderous kidnapping wasn't for negotiations, nor to show that they want a state. That is the message we must take from it. We are not dealing with rationale peace-loving people. We are not dealing with sophisticated lovers of arts and opera who just hate Jews and want to annihilate us. These Arab terrorists aren't like the German Nazis; they are worse. There is nothing more I can say now. I'm sick to my stomach from the terrible news. I had been suspecting that we would find the dead bodies of the boys. I am not personally acquainted with the families. I hope they feel my hugs along with the support of so many others. My heart is torn. You are right--worse than Nazis. May HASHEM soon punish all the Arab Nazi Muslim murderers a thousand times over for the deaths of those three righteous Jewish teenagers and all the other Jews that they murdered. May HASHEM soon wipe them off the face of the earth, just like He did to the generation of Noah and the inhabitants of Sodom. Sefer Tehillim, perek tzadi daled. I did rip my outer clothing - thank you for reminding us of an appropriate immediate response. But there must be more - after our dead are buried and no longer lie "before us." Many more preceded them in being murdered by our enemies, yet the nation was not united over them. I hope we will also keep them, as well as "our boys" in mind when we consider our response, and how this has changed us. It is my hope that there is no going back (to sleep) now. CDG, twenty years ago, after Oslo, I went around with a ripped Israeli flag pinned to my shirts, even at my son's Bar Mitzvah. I guess I never should have put it away. Israeli Media, Again, Humanizes Arab Terrorists! Yes, I am Still Tremping, aka Hitchhiking! Make The World Listen! Bring Back Our Boys!!! MK Zuabi Should be Arrested for TREASON! Parshat Shavua "Shlach," Who Asked Your Opinion? Peres is Really Going to the Pope's "Peace Party"